Some 60% of British people believe in at least one conspiracy theory, a recent poll reveals. From the idea that 9/11 was an inside job to the notion that climate change is a hoax, conspiracy theories divert attention away from the facts in favour of plots and schemes involving powerful and secret groups. With the aid of modern technology, conspiracy theories have found a natural home online. 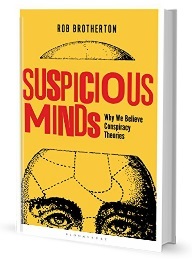 Conspiracy theories often unfairly and erroneously accuse minority groups of doing bad things. For example, one conspiracy theory accuses Jewish people of plotting to run the world, including the outlandish idea that Jewish billionaire George Soros is a mastermind of a vast global conspiracy to “reduce humanity to slavery”. Another conspiracy theory proposes that global warming was created by the Chinese in order to make US manufacturing non-competitive. Yet another conspiracy theory accuses immigrants of plotting to attack Britain from within. In our research, we wanted to look at the impact of these types of conspiracy theories. How do they actually make people feel about minority groups? In our new paper, published in the British Journal of Psychology, we try to answer this question based on the results of three experiments. In a new paper published in the British Journal of Social Psychology, we have found that people who believe in conspiracy theories – such as the theory that Princess Diana was murdered by the British establishment – are more likely to accept or engage in everyday criminal activity. In our first study, the findings indicated that people who believed in conspiracy theories were more accepting of everyday crime, such as trying to claim for replacement items, refunds or compensation from a shop when they were not entitled to do so. In a second study, we found that exposure to conspiracy theories made people more likely to intend to engage in everyday crime in the future. We found that this tendency was directly linked to an individual’s feeling of a lack of social cohesion or shared values, known as ‘anomie’. In summary, our research has shown for the first time the role that conspiracy theories can play in determining an individual’s attitude to everyday crime. Specifically, we found that that belief in conspiracy theories, previously associated with prejudice, political disengagement and environmental inaction, also makes people more inclined to actively engage in antisocial behaviour. It demonstrates that people subscribing to the view that others have conspired might be more inclined toward unethical actions.